It was a challenge to find just the right brush to optimize my facial routine. I tried many different brushes but found that they were all too soft. Even battery powered exfoliating sets come with a separate facial brush that turns soft and mushy when used often. I finally had to design one that was effective and appealing. I use a specially designed brush with natural bristles. Unlike other brushes, it is not too soft. Many beauty books tell you that you should not exfoliate more than twice per week. However, when you eat plenty of raw foods, your skin heals much faster. At first, you must be gentle while brushing, but gradually you can brush more vigorously. Your face will begin to glow! I perform this procedure every day. You hopefully already eat very well, and this is great, but it's not enough. We need to take care of our skin externally. A daily beauty routine will make a big difference in how youthful your skin will look. 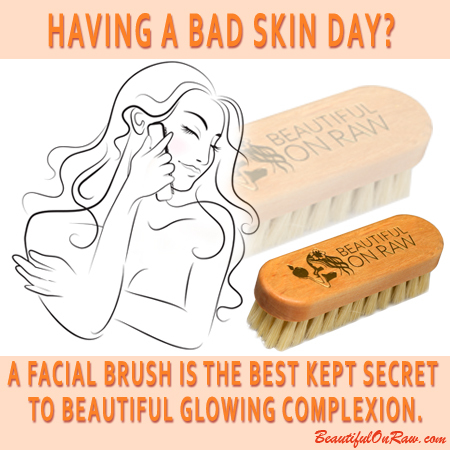 My brush is probably the most important beauty tool you’d need. Why? Because exfoliation is a vital key to beautiful skin. Three days after using the brush, my husband says to me, "You look prettier. Are you exfoliating?" My jaw hit the floor. I couldn't believe he noticed! (And I didn't know he knew what "exfoliation" meant!) My skin is clearer and less prone to breakouts. I love my brush and use it faithfully. Thank you Tonya! Exfoliation noticeably speeds the cell renewal rate, giving you new skin in a matter of minutes. Exfoliate as often as your skin will permit without becoming irritated. Gradually you can build up to where you can exfoliate every day, even twice a day. Daily exfoliation will approximate the effect of shaving, which is thought to contribute to men retaining the youthfulness of their facial skin for a longer time than women. I am thrilled with the brush I use which, while being not only the right size and stiffness for facial use, it is also a lovely blonde color, making it aesthetically appealing as well as practical. For my beauty routine, I first dry brush my face and then follow that up with my Facial Cream GLOW. 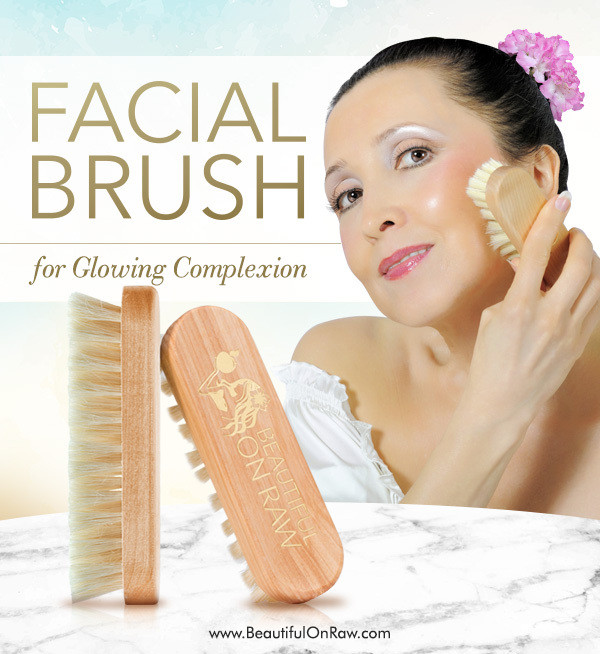 So I am offering the Facial Brush FREE to anyone who purchases two jars of my specially formulated GLOW Cream. Occasionally you'll need to clean your facial brush. The best way is to rub some cornmeal into the brush for a few seconds, let it sit and then scrub it out with your fingers or by vigorously brushing a clean rag. The cornmeal will absorb dust and oil from the brush and whisk it away to keep your brush it tip top shape. Do not use water and soap as this will shorten the lifespan of the brush.